These routes will connect different areas in Atlantis and will also provide residents with safe, affordable and reliable public transport to the city. As a temporary arrangement passengers who are travelling from Atlantis to the Cape Town CBD will have to change buses at the Table View station. 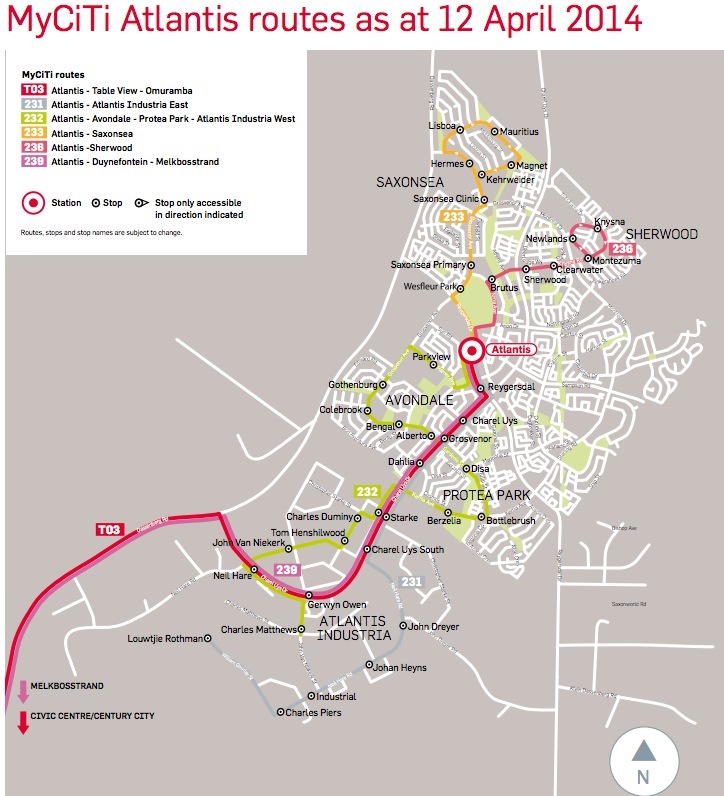 The City wants to stress that this is only a temporary arrangement until the second phase of the MyCiTi bus service in Atlantis is launched in August 2014 when the T02 trunk route from Atlantis to Table View and the Civic Centre station will commence. During the first phase of the MyCiTi bus service in Atlantis, buses will run from as early as 05:00 until as late as 22:00, depending on the route and the day of the week and at intervals of every 10 to 30 minutes. The service will commence with the 9 metre buses which can accommodate 25 seated and 25 standing passengers each. The 12 metre buses will be added to the trunk service – the route from Atlantis to Melkbosstrand and Table View – once the City receives the new buses from the supplier. The City will withdraw only 45 of the 81 minibus-taxis serving the Atlantis area when the MyCiTi bus service is launched on 12 April 2014. To meet the demand in Atlantis for public transport, the existing buses operated by Golden Arrow Bus Services and Sibanye will continue to be fully operational until the second phase of the MyCiTi bus service in Atlantis is launched. Passengers should note they need to get a myconnect card loaded with enough credit for their trips on the MyCiTi buses. Each passenger needs a myconnect card to travel as cash is not accepted on the bus. Passengers can buy a myconnect card from MyCiTi stations for R25 and load credit on their cards for their trips. 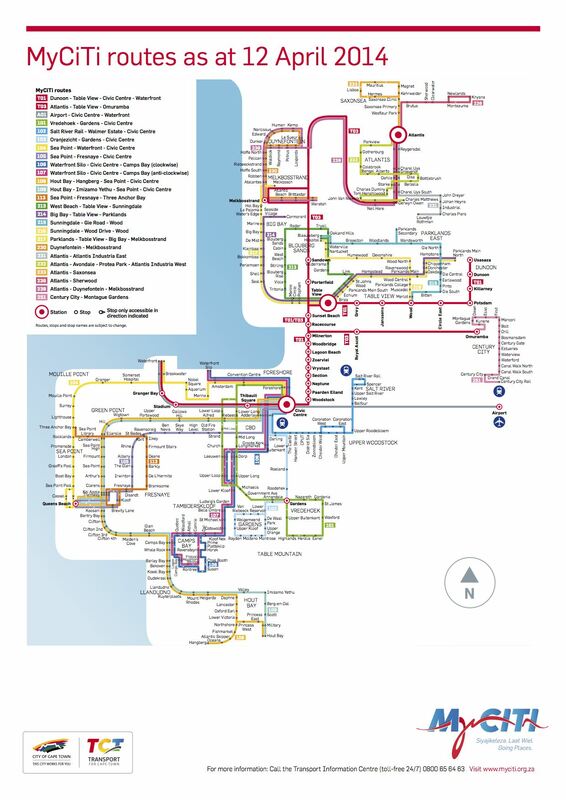 As with the launch of other new routes, Transport for Cape Town will waive the R25 card fee for a limited period. Anyone can visit the Atlantis MyCiTi station in Reygersdal Road from 5 April 2014 and bring R30 and proof of their identity. The R30 pays for the Mover points to be pre-loaded on their myconnect card. More information from City of Cape Town website.